The lake level is 557.30 and has risen 1-1/2 inches in the last 24-hours with a few hours of generation. The lake is getting very clear and is in excellent condition with a surface temperature in the early to mid 60's. Crappie, bass and catfish are the best bite now with several walleye showing up. 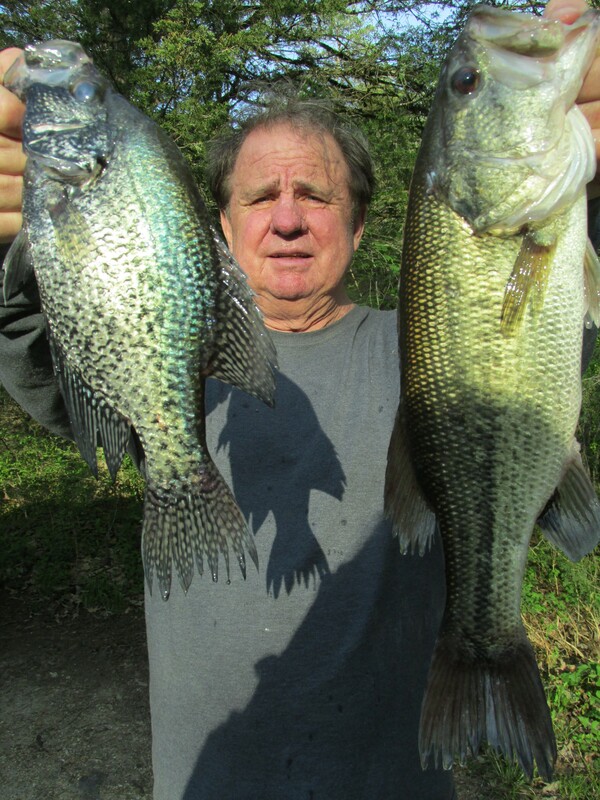 The crappie being caught now have not spawned and are in the 12-13 inch range. The bigger ones have spawned. The exact same thing is happening with the bass. Catfishing is good on trot lines. Top water bite for bass and temperate bass is picking up early but I am disappointed in the size of the stripers. 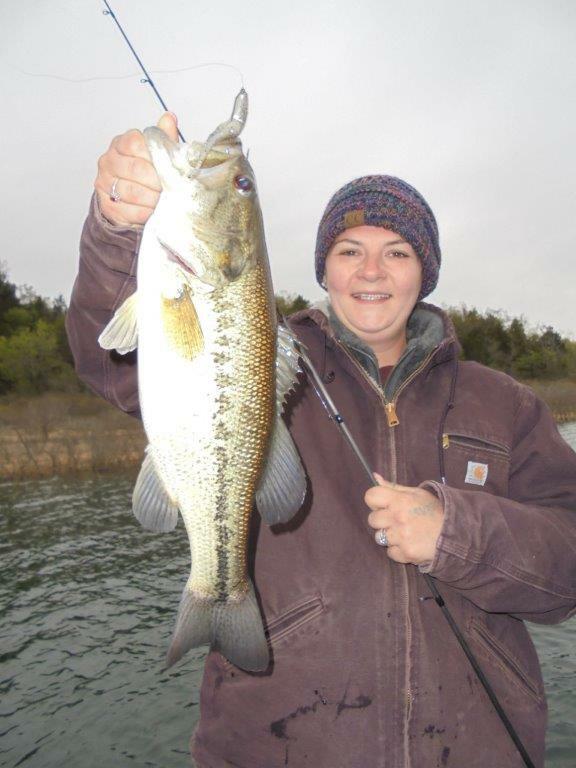 The bass population on Norfork is excellent and the fish are getting larger and larger. Largemouth in the 6-lb. range used to be uncommon but not anymore. Also 4-lb. smallmouth are common. I caught a 3-lb. Kentucky bass earlier this week. There is a good chance of rain for the next couple of days and then nice again for the weekend. There should be no complete rain out day for a while with tonight and tomorrow being the best chance. We finished the remodel on cabin #9 (the mobile home) last night and it is now ready to rent. It is the only thing that has kept us from being full for the last two weeks. I planted the garden yesterday and the yard was mowed again. Everything looks good here and wildlife is everywhere. I love hearing those Purple Martin and Pileated Woodpeckers. Come on down we will not charge you too much. If you are already here check out Blackburns before you leave. Our beautiful valley speaks for its self and we have the largest magnolia tree anywhere and it will bloom soon. Our children playground is second to nobody. Our coin laundry has two washers and three dryers. We have it all here at Blackburns and at the best price and are closest to Mountain Home, dining and shopping. No sense staying 10-miles from anything. Remember the size limit on walleye is 18-inches. Too many people are killing short ones. Caught fishing with Bink's guide service yesterday. The lake level is 557.22 and has risen 2-inches in the last 24-hours with only three hours of generation. They are running Table Rock generators hard to protect Branson and leaving Norfork behind like a step child again. The rules need to be reviewed and changed leaving politics out. The lake is warming rapidly and fish are spawning. Many big bass and crappie are spawned out and are moving to 20-30 ft. brush. Middle sized ones are still on the bank or on brush. Carp are way back in the creeks spawning and making a big commotion. 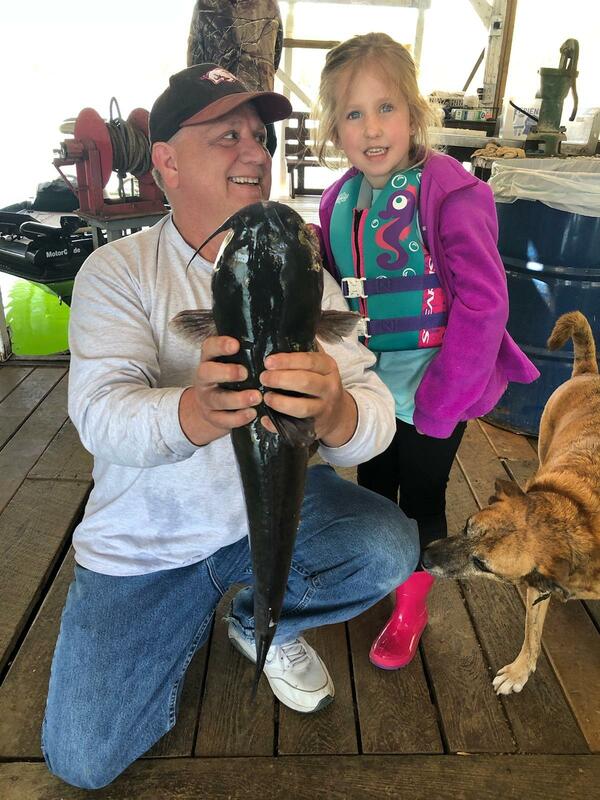 Channel cats are biting well and just a few flatheads are showing up. They are the last to spawn and only bite live bait. People using hot dogs are catching smaller fish and ones using live shiners catching bigger ones. The lake is warming nicely again and is in the mid 60's in some places. I still do not know where all of these bluegill that are from one to one and one half inches are coming from. Must have been a fall spawn but the bass and catfish sure do like them. Top water stripers and bass are getting better every day and some stripers are being caught north of Cranfield near dark. The weather has been perfect with rain moving in again Wednesday and continuing until thursday night. The weekend looks good again. 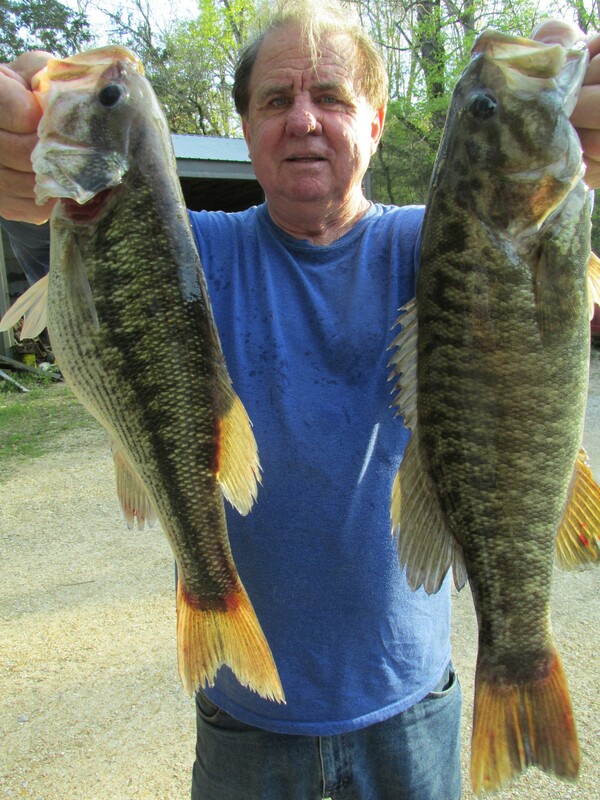 Crappie, bass and catfish are the best bite with some white bass coming in but we do not count them. I hope people do not kill a bunch of small top water stripers as we need to build up the supply of big ones. If you are staying at a place where you are nearly the only customer you are paying too much. Do some shopping. Mike and laney caught a big catfish. Toby is checking it out. Cannot get them all in one picture. You like green flat playground? This is it. The lake level is 556.86 and has risen 3-inches in the last 24-hours with just a little generation. The weather has been beautiful. Catfish are biting as well as bass and crappie. Many fish are spawning. There is a top water bite most mornings for both stripers and bass. The lake is warming and is in the lower 60's. 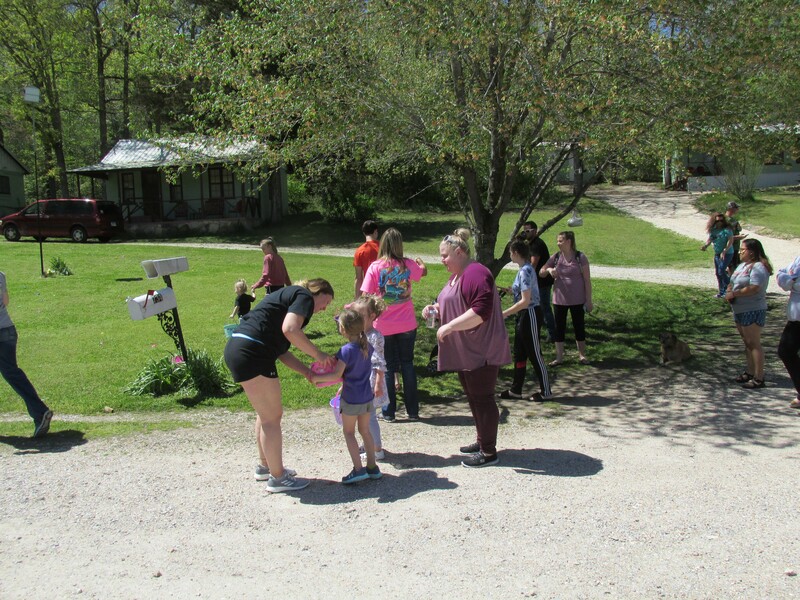 We are having a wonderful easter here at Blackburns and the egg hunt went over well. 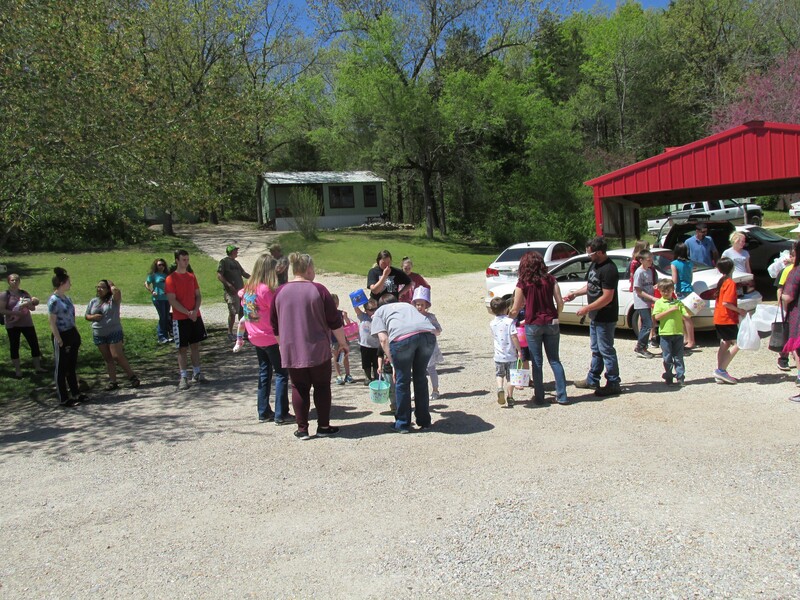 We had about 50-children of all ages and over 1,000 eggs. Debbie separated them into three groups acording to age and off they went. Wish your children and grand children could have been here. The place was full. Several children found new friends and we had pizza afterwards. The weather was perfect. We like fun here at Blackburns with no drama. 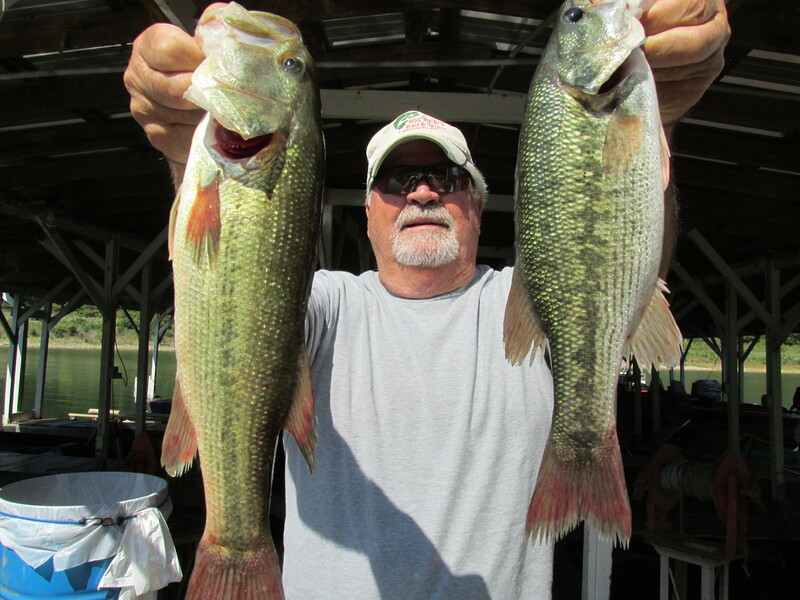 Tommy Smith is catching a lot of catfish on his trot line and others caught stripers, bass and crappie. Fun was had by all. The lake was pretty busy and in great condition. Blackburns has people here doing construction, buying property, waiting on builders, mushroom hunters, bikers and people just resting. About 1/2 of out business is fishermen and we like all of them. It is a good group. Come on down. We will not charge you too much. Caught fishing with Bink's Guide service. The lake level is 556.55 and has come up a foot in the last 3-days and 3-1/2 inches in the last 24-hours with just a few hours of generation. I had a 62 degree water temperature yesterday and it was cool and windy. Our normal high is 70 and normal low is 50. It is beautiful today for the Easter Egg hunt at 2:Pm and is to be near 80 tomorrow and sunny again. Perfect for being on the lake. The lake in general is in excellent condition. 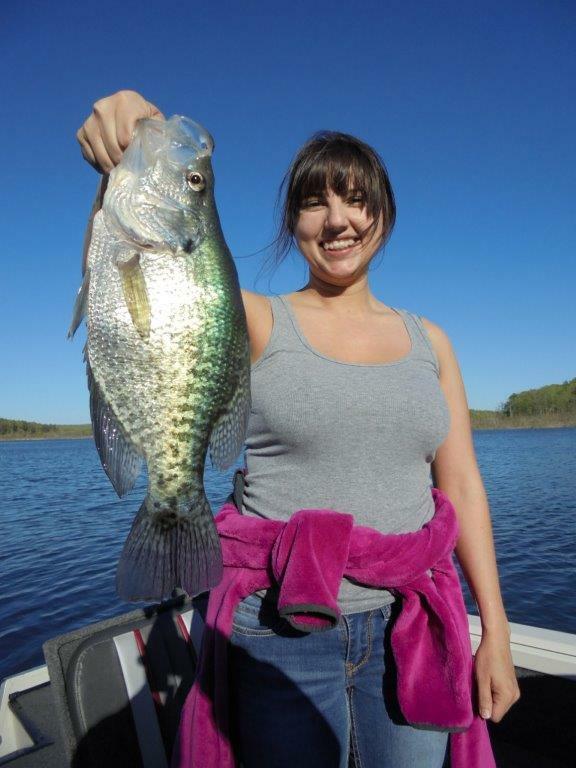 Crappie fishing has slowed a bit but some are being caught. The spawn for crappie and bass is in full swing and it would be nice if the water level remained stable for a few days. Walleye are shallow and will remain so until the thermocline forms and then they will move near it at 16-18 ft. of water near the bottom. It will take a few very warm days for that to happen and is usually in early May. Mushrooms are up and will start to dry up with too much hot weather. Turkeys are gobbling all over. We are mowing the grass every week. Blackburns is full now but have some openings later this week. 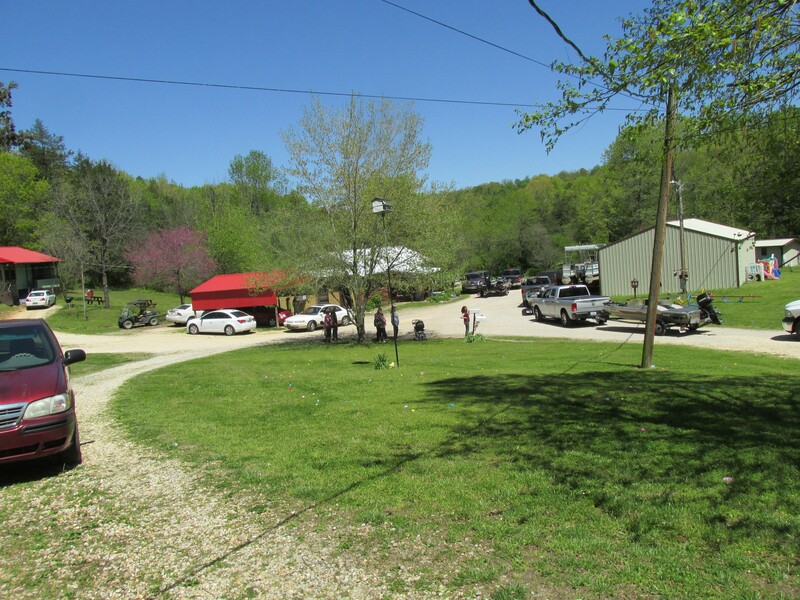 People are taking advantage of the low prices on both cabins and boat rental here and your first boat stall is free. No charges for trolling motors on pontoons. You can save hundreds of dollars on a week-long stay here at Blackburns. You do not have to go elsewhere to launch your boat and we have ample parking and a gentle slope to the dock. 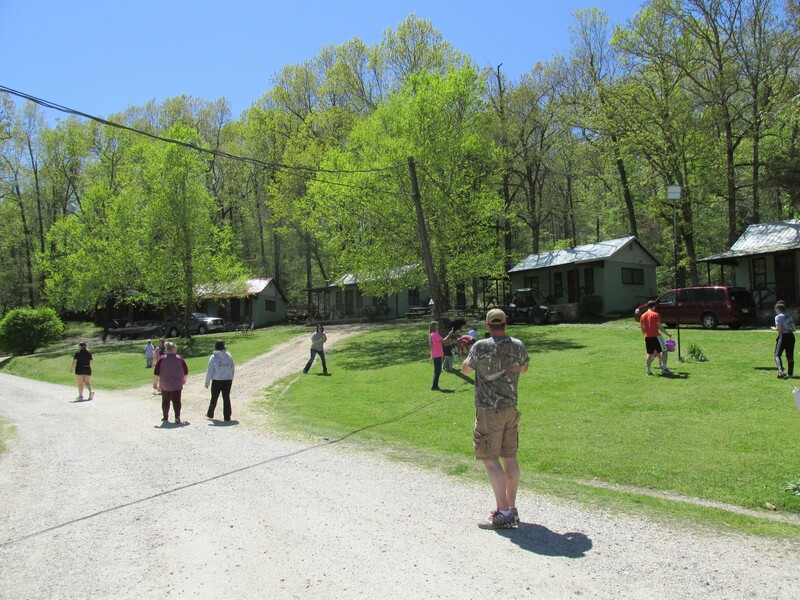 This is the family place and all cabins have covered porches and there are no duplexes. On rainy days you can rig fishing poles, play cards and smoke on the porch with no umbrellas. No smoking in cabins. Come on down. We will not charge you too much. Tom Kelly is one good fisherman. Under the dock with these big boys. The lake level is 555.70 and has risen 3-inches in the last 24-hours. They quit generating yesterday afternoon and have not started up yet. Hope they do. They always quit when it rains to let the lake rise as much as it can. We received about 0.4 inches of rain last night and this morning and it is very cloudy now. The Easter Egg hunt is saturday at 2:Pm and the resort will be full of guests and much family and friends. It gets bigger every year and some of the children that were very small when we started have their own now and they are helping with the hunt. It is to be in the 70's and sunny by gametime. Free pizza and hundreds of eggs. 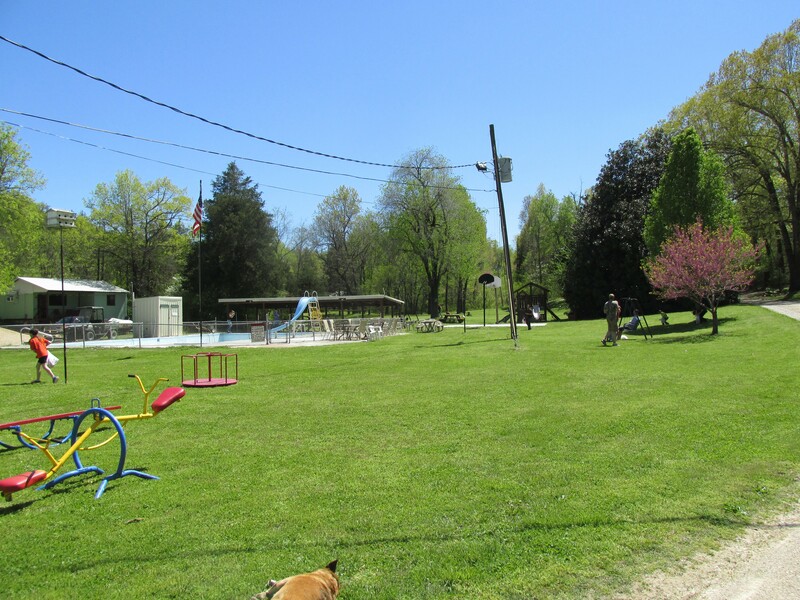 We have about 4-acres of flat green grass and a big playground for the hunt. Fishing was pretty good yesterday and bass were biting. I was using my old standby grub and minnow and working part way back in a creek behind brush piles. Lake surface temperature was 60 degrees and some fish have moved out a little deeper. The threadfin shad will spawn at a late 60's and early 70's surface temperature and it does not look like we will make that before full monn in May. You have to change bass fishing techinques when this happens. The overall spawn has slowed with the cool ambient temperature and lower water temperatures. I was finding surface water temperatures in the 70's but not now. This is typical for April. It is not as variable as March but almost. Tom Kelly is using a shakey head worm, Bink is using creature baits and I am using the grub and all are catching fish. There are lots of one and one half inch long bluegill minnows showing up near the bank and are drawing catfish to them at night.